The Inhambane province, in which the Bazaruto Archipelago can be found, with its abundance of coconut palms and cashew trees, is an area known for its undeveloped natural beauty. Comprised of four islands and surrounding islets and reefs, Bazaruto’s transparent water and rich variety of marine life makes it one of the most popular spots for diving in the world. Here one can also spot exotic birds like the flamingo and the endangered dugong. Further up the coast are many secluded beaches, such as Pomene Bay. The Nature Reserve and small community of Pomene help keep it in pristine condition. Surrounded by dunes and sandy forests, the reserve is home to a wide variety of bird and animal species, such as ox-horses, monkey-dogs and grey monkeys. 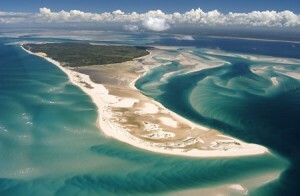 This area also offers spectacular fishing and scuba diving opportunities. South of Inhambane, Praia do Xai Xai is another popular beach with a massive reef providing protection against the strong waves at high tide. The reef creates several small pools during low tide and the locals use this opportunity to gather shellfish to sell to tourists. The four main islands (Bazaruto, Benguerra, Magaruque and Santa Carolina) can all be accessed via plane, helicopter, or boat from the charming coastal town of Vilanculos. 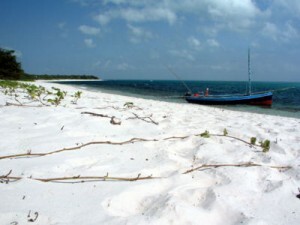 Bazaruto is the largest of all the islands in the archipelago and is known for its beautiful turquoise sweater, idyllic beaches, and wild fauna. 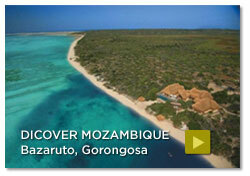 Our recommendations for accommodation on this island are the Anantara Bazaruto Island Resort. 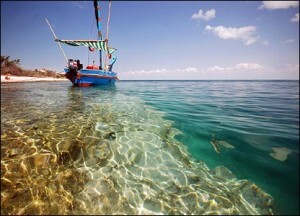 The island of Benguerra offers snorkeling, scuba diving, deep sea fishing, 4×4 tours, star-gazing and walks. 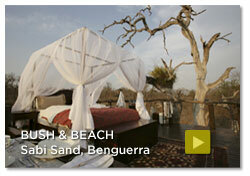 Benguerra also features the eco-friendly luxury lodge, Azura. The resort is the first eco-boutique and was just granted its Carbon Neutral Status, another first in Mozambique’s history. Another resort our team highly recommends is the Benguerra Island Lodge which features exquisite accommodation, a wide range of activities, and outstanding cuisine amongst breathtaking views. Magaruque is a tiny island that one can easily walk around in just one afternoon. There are hundreds of shells that are exposed by the low tides on its sandy shores and it offers excellent snorkeling and scuba diving. Dolphins often pass by within meters of the beach in the shallow waters. The island is easily accessible from Benguerra and Vilanculos. Santa Carolina or Paradise Island, is the smallest of the 4: this beautiful island is highly regarded as the jewel of the four islands. On a day trip to this island, tourists can expect to see crystal turquoise waters, gorgeous beaches and shallow reefs which are great for snorkeling.